Dear All, Hope you all enjoyed all these days with the articles posted in this site. Now, In coming days we are planned to cover ancient journey of Lord Rama with all the details on Temples and stories with Morals narrated by Sri Velukkudi Krishnan in his series program, which was broadcasted in Star Vijay South Indian Channel with the title "Sri Ramanin Padhaiyil". The program "Sri Ramanin Padhaiyil" is all about the yatra (pilgrimage) named "Sri Rama Anu Yathirai" organised under the greatest support and guidance of famous Hindu religious figure Sri Velukkudi Krishnan Swami along with volunteers and members of "Kinchitkaram Trust". Around 600 members enjoyed this spiritual yatra by participating in it. It was held twice, once in 2006 & once in 2010. It was telecasted weekly once on every Sunday at 08:30 AM. It consists of 30+ episodes starting from April 21st of 2013 and ended in the month of December 2013. Anu Yathirai journey included Story, Upanyasam (narrating stories from Ramayana epic and purana), Parayanam (reading the slokas related to Ramayana in equivalent proportions over a period days) along with Lord Ram Bhajans/Songs and Slokas/verses from Kambha Ramayana, Valmiki Ramayana etc.. This yatra was very helpful in understanding the significance of the places visited. With this brief introduction, let us move on to the information shared in Episode 01 of Sri Ramanin Padhaiyil. The Ramayana is one of the two great epic's of Hinduism, the other being the Mahabharata. It depict's the duties of relationships, portraying ideal characters like the ideal father, ideal servant, the ideal brother, the ideal wife and the ideal king. The name Ramayana is a tatpurusha compound of Rama and ayana ("going, advancing"), translating to "Rama's Journey". The Ramayana consists of 24,000 verses in seven books (kandas) and 500 cantos (sargas), and tells the story of Rama (an avatar of the Hindu supreme-god Vishnu), whose wife Sita is abducted by Ravan, the king of Lanka. Thematically, the Ramayana explores human values and the concept of dharma. Lord Rama took two yatras (journey) according to the epic Ramayana. Yatra 01: This yatra or journey was taken to marry Sita Mata at the age of 12. After marriage Lord Rama & Sita Mata resided in Kingdom for period of 12 years. Yatra 02: This yatra or journey was taken on the demand of Kaikeyi, in which Lord Rama was sent to exile for period of 14 years. You all will be travelling to all the destinations where Lord Rama traveled through our upcoming series of articles. To cover all these places, we have to travel through 6 States of India distance of around 8500 KM's. This distance was traveled by Lord Sri Rama through foot only. The same is not possible by us, hence we use all means of transport available like Bus, Train, Boat etc. to cover all these places. The road from Ayodhya to Janakpur, which was the route, used by the bridegroom and his “baraatis” (family) to reach Ayodhya after the Ram-Sita marriage in Janakpur acquired the name “Ram-Sita Marg” long ago. Shri Ram and Rishi Vishwamitra, however, took another route to reach Janakpur after the slaying of Tadaka in Tadakavan (Forest of Tadka). The route of the “baraatis” is known as Ram-Sita Marg and it is now a proper road. Millions of pilgrims actually cover the distance on foot till today to enact the marriage of Ram and Sita. Shri Ram was only fifteen years old when he and Lakshman set out with Rishi Vishwamitra to annihilate the demons that were polluting and obstructing the sacred rituals of his Yagna (fire sacrifice). Their first halt was on the banks of the River Sarayu, twenty kilometers from Ayodhya. Valmiki’s Ramayan describes the tranquil setting against which, Vishwamitra taught the princes the art of “bal” and “atibal” which endowed them with immunity from disease and eternal good health besides freeing them from pangs of hunger and thirst. Valmiki’s Ramayan describes the tranquil setting against which, Vishwamitra taught the princes the art of “bal” and “atibal” which endowed them with immunity from disease and eternal good health besides freeing them from pangs of hunger and thirst. Walking past Azamgad, Shri Ram, Lakshman and Sage Vishwamitra reached Balliya where River Sarayu merges with the holy river Ganga. This haven on the banks of the Sarayu was the chosen place for sages who spend long hours in meditation. Shri Ram rested here in the night before he set out at dawn crossing river Ganga to reach Vishwamitra’s Siddhashram. At night, before the princes went to sleep, Vishwamitra narrated to them the story of Kamdhenu (God of Love) who was burned to ashes there by Lord Shiva. After crossing the holy Ganga, Shri Ram and Lakshman reached a dense forest where demoness Tadka lived. The dreadful forest was known as Tadkavan. Shri ram ended Tadka’s reign over the forest by slaying her and freeing its inhabitants from terror. The forest stretched between Bharoli and Baksar in Bihar. Shri Ram performed the first task of his “avtaar” (incarnation) here by destroying the evil demoness. Rishi Vishwamitra’s Siddhashram was located not too far from Baksar. Siddhashram, according to Adhytma Ramayan was a social ashram where religious instruction was imparted to people. Shri Ram and Lakshman sojourned in the ashram for three days after Shri Ram killed Mareech and Subahu, the demons who were tormenting Rishi Vishwamitra by dirtying his Yagna (fire sacrifice) with bones and blood. Lakshman destroyed an entire demon force brought by Subahu while Shri Ram took on the might Mareech, son of Tadka, the demoness he had done away with earlier. There are villages existing today on the banks of the River Ganga with the names Mareech and Subahu. Three kilometers from Buxar in the northern direction is the village Ahroli. Rishi Gautam had his ashram here. According to Ram Charita Manas it was here that Shri Ram delivered Ahilya, the beautiful wife of Rishi Gautam, from a curse of her husband, which had turned her into stone. When Shri Ram and Lakshman left Siddhashram they crossed River Ganga and River Sonbhadra and set foot on the soil of Ahroli village, which still exists in Buxar district. Parev and Trigama are two places of significance. They have a distance of five kilometers between them. When Shri Ram and Lakshman crossed River Sonbhadra, they reached a place before Patna where they spent a night before moving on to Janakpur. Vishala Nagri is in the district Vishali. Ram and Lakshman crossed River Ganga and reached this town with Rishi Vishwamitra who guided them to a garden to rest for a while in its fragrant surroundings. Valmiki’s Ramayan says Gautam Rishi’s ashram was in Mithila. Ahilya resided there as Shila. The place was therefore named as Ahiyari after her. Thaiyavalk (Jagvan), Shringi (Sringya), Bhringi (Bhairav) and Gautam Rishis lived there. Bisaul was Rishi Viswamitra’s place of residence. After reaching Janakpur Rishi Vishwamitra stayed there and he set up his ashram in a garden. Phulhar village was situated in one of Raja Janak’s prime gardens. It was in Jamuni (Madhubani) and was celebrated for a Gauri Temple where Sita prayed regularly. After paying obeisance to his Guru Vishwamitra when Shri Ram entered the floral section of the garden, Sita, who was present there, got her first glimpse of Shri Ram. In the vicinity of Janakpur was Matihani from where, according to folklore, mud was collected and taken to create the venue for the marriage of Shri Ram and Sita. Matihani has become a sacred place as even today maidens for their marriage take mud from here. Janakpur was the capital of Raja Janak’s kingdom. It lies 20 kilometers from India’s border and is known for a temple of Ma Sita which attracts pilgrims round the year. It is believed that the Dhanush Yagya (competition for lifting of the bow) or Sitaswayamvar, as is popularly understood was announced before an invited royal gathering in a huge maidan (field) close to the present Janaki Mandir. It was here that Shri Ram picked up the Shiv Dhanush and broke it into two halves with ease. Note: The important places in Janakpur include Matihani, Rangbhoomi, Dhanusha Mani Mandap. All of them are associated with the legend of Shri Ram and Sita’s marriage. According to beliefs, Mithila, one of the principalities of Raja Janak’s Kingdom was passing through the trial of drought and famine. Following royal tradition, Raja Janak took out the golden plow and went to an arid field to plough the soil and appeal to the gods for rain. While performing the ritual, the plow got stuck in a deep grove in the soil. The king’s men rushed to pull the plow out of the depth of the soil and lo and behold there was a girl child waiting for help. The childless king happily adopted her as his daughter and named her “Sita”, the Sanskrit term by which the cutting side of the plow is known. The name of the village, Sitamarhi, is derived from the name Sita as a result. Travelers going to Janakpur in Nepal invariably stop at Sitamarhi for a “darshan” (sighting) of the land where Sita manifested in the soil. It is said that the “baraatis” (procession of the bridegroom’s family) while returning to the kingdom of Ayodhya after the Ram-Sita marriage stopped at Sitakund Motihari for a little rest. They bathed and freshened themselves in the Sita Kund. One of Sita’s bangles fell in the kund (pond), it is believed. The baraatis (Bridegroom’s family) offered a puja (worship) to Lord Shiva here. Sitakund is located 20 kms from Motihari in the South Direction. It is a well-known place in the Northern Indian Belt. Dearwan which lies ahead of Sitakund is not far from Sitakund. The baraatis (Bridegroom’s family) had camped at this place and hence the name Derwan. The word “Dev” in Hindi means camp. The true meaning of Dohari is Do Hari, i.e. Two Haris. One commonly used name in the worship of Lord Vishnu is Hari. As per Valmiki Ramayan, the baarat was on the way to Ayodhya when the earlier Avtaar (incarnation) of Vishnu, Parshuram, stopped the baaratis at this place on the banks of the river Sarayu. Parashuram tested Shri Ram and realized who he was. Both the Haris (Parashuram and Ram, the two Vishnu avatars) met here and Parashuram returned to Mahesgiri Mountain after offering his respects to Ram. Raja Dashrath and the “baraatis” then continued their journey back to Ayodhya with Shri Ram. South. Hence this makes it even more difficult. Still we have charted a basic route, which can be seen here in the above map. There are many places that Ram visited during this 14 year period during which he had the good fortune of meeting with some of most enlightened sages and beings of that period. They were of course very delighted to meet with Ram themselves with many of them having been foretold the coming of Ram, they waited for years conducting severe penance for that fortunate time to arrive. Ayodhya was the capital city for the Isvaku Dynasty (Suryavanshi) of Kings. This was also the city where Son of Dasrath, Shri Ram was born (appeared). In twelve kilometers vicinity of Ayodhya there exist holy places like Vedi Kund, Sita Kund, Janaura etc. that are also part of the journey of Shri Ram’s “vanvas” (exile) route. It was also from Ayodhya that Shri Ram started his journey along with Sita and Lakshman. Ayodhya was a majestic city comparable to any international city of modern times almost eleven kilometers in length full of parks, gardens, theatres and modern infrastructure and facilities for its citizens. The citizens of Ayodhya loved their Kings. It was here that Shri Ram along with Sita, Lakshman and Sumantra Minister (Mantri) rested on their first night. The modern name for Tamsa River is Madhar River and the place from where she flows is called Gora Ghat. This place is about twenty kilometers from Ayodhya. On the banks of the Tamsa River there is a place known as Purva Chakiya. The citizens of Ayodhya followed Shri Ram until this spot after their dearest Ram departed from Ayodhya. Shri Ram, Lakshman and Sita disguised themselves and left this spot in the middle of the night so that none of the people would be able to follow him. On the banks of the Gomti river, Sage Valmiki had an ashram. It was from here that Shri Ram crossed the Gomti river. The old name of Sultanpur was Kushannathpur, which was named after the son of Ram, “Kush”. The present day name of the Vadrathi River is Sarkani River. This place is situated around 8 kilometers from Pratapgarh in the Eastern Direction. Shri Ram had crossed this river near the town of Mohanganj, as per Valmiki Ramayan. The current day name of the Sandika River is Sayi River. This place is situated at a distance of twelve kilometers from Pratapgarh. This is place is also commonly known as Dev Ghat. Shri Ram has crossed this river from this spot. There is also a Shiv Temple here that was established by Bharat. This place has been mentioned in the Valmiki as well as Tulsi Ramayan. The current name of this river is Balukatti. This place is approximately 15 kilometers from Pratapgarh in the Southern Direction. Shri Ram had crossed this river here as has been mentioned in the Valmiki Ramayan. Singrora is the current name of Shringverpur. This was the capital of Nishad Raj Guha. This place is situated around twenty kilometers North of Allahabad. Shri Ram has rested on a bed of grass here. The next morning he crossed the Ganga River from here and proceeded to the Bharadwaj Ashram. The incident of “Kevat Prasang” took place here. This holy pond is around two kilometers from Shrinverpur. It was from here that Shri Ram sent back their beloved minister Sumantra to Ayodhya. This is the divine meeting place of the three holy rivers of Ganga, Yamuna and Saraswati. Shri Ram himself has praised this spot for its spiritual powers, which can uplift mankind. Bharadwaj Rishi had his ashram here. Shri Ram had rested in this ashram for a night. Ram Charita Manas as well as Valmiki Ramayan give a lot of importance to this place. Shri Ram along with Lakshman and Sita crossed the Yamuna River. In the Valmiki Ramayan the reference to Lakshman constructing a boat to cross the river has been made for this place. After resting overnight on the Simri Ghat Shri Ram crossed the river using the boat made by Lakshman. There are many places on the banks of the Yamuna related to the exile period of Shri Ram like Akshay Vat, Sita Rasoi (Jasra Bazaar), Rishiyan (the abode of Rishis), Murka (Hanuman Mandir). Shri Ram walked along the banks of the Yamuna River in his onward journey. After crossing the Yamuna River, he reached what is known in today’s time as Ramnagar. This is place is birth place of Tulsi Das, the great poet who has written Ram Charita Manas. After visiting Sage Bharadwaj’s Ashram, Shri Ram reached Valmiki’s Ashram and he spent the night here. It was here that Sage Valmiki himself suggested to Shri Ram to make Chitrakoot his home for a few days. As suggested by Sage Valmiki, Shri Ram reached Chitrakoot Dham. Shri Ram made his ashram on the Kamadgiri Mountain near the Mandakini River. There were many sages, holy men and rishis who had made their ashrams (abodes) near the Kamadgiri Mountain. It was this divine spot where Shri Bharat met with Shri Ram and took his padukas (slippers) with him to Ayodhya to place on the throne. Chitrakoot has many places of pilgrimages in its vicinity like Madakini River, Bharatkoop, On the banks of the Mandakini River – Spatik Sheela, Hanuman Dhara and Atri Ashram, Gupt (Secret) Godavari. All these sacred places strengthen the place of Chitrakoot as a one of the most important places of pilgrimages while tracing the footsteps of Shri Ram’s journey of exile. After the visit of Bharat to Chitrakoot, many citizens of Ayodhya had started to visit this place. Many of the holy men and sages in this area started to feel disturbed by the presence of so many people and it then that Shri Ram decided to leave this place. Hence all in all Shri Ram would have stayed in Chitrakoot for only about one or two years only. The majority of his exile period he spent in the Dandak Forest. Around 7 kilometers from Atri Ashram, in the middle of the jungle, there is a beautiful place called Amravati. One of the ancestors of Shri Ram called Ambrish had conducted an intense penance here for many years. After leaving Chitrakut, Shri Ram came to Sage Atri’s Ashram. It was here that the Sati Anusuya (pure and chaste wife of Sage Atri) gave the sermon of “Pati Vrata Dharma” (service to husband) to Mother Sita. After resting in Sage Atri’s Ashram for one night, Shri Ram spent the next night at the place of penance of Ambrish (his ancestor). It was in this forest that Shri Ram killed the Rakshas named Viradh. In the vicinity of Amvarti there is a village called Jamunihayi. There is a very dark and dangerous looking pit called “Viradh Kund” (pond). This pit is situated three kilometers from Amravati. After killing the demon Viradh, Shri Ram had buried him here. Around 13 kilometers from current day Chithara Station, Satna, Madhya Pradesh is probably where the Shabrang Ashram of the Ramayan is situated. After the slaying of Viradh, Shri Ram visited this ashram. It was here that he had the divine “darshan” (sighting) of the God Indra. After having the “darshan” (sighting) of Shri Ram, Shabrang Rishi with the help of his Yogic Fire destroyed his body and attained salvation. Ramtek is a beautiful mountain near the city of Nagpur. Shri Ram stayed here for some time. This mountain is also connected with the writer Kalidas who wrote the famous poem “Meghdoot” according to some historians. Approximately 9 kilometers from here there is a place called Salbardi near which there is a place of pilgrimage called Sita Nahani. According to popular legend, Shri Ram proceeded to the ashram of Sutikshan Muni from here. After meeting with Sharbang Rishi, Shri Ram reached the ashram of Sutikshan Muni. He had spent 10 years in the Dandaka Forest before reaching here. Sutikshan Muni was the disciple of Agastya Rishi. Shri Ram rested here for some time. He killed many of the demons residing in this area and also took a vow that he would rid this area of all the evil influences. There is an ancient temple of Goddess SaptaSrungi here, which attracts many pilgrims. It is said that Markandaye Rishi wrote the Durga Saptastuti at this holy place. According to popular legend, Durga Ma killed the demon Mahisasur at this place, which is represented by a hole in the mountain, which can be seen till today. The demon was hiding behind the mountain when Durga attacked him. Approximately 16 kilometers North of Nasik there is an Ashram called Agasteshwar Ashram. 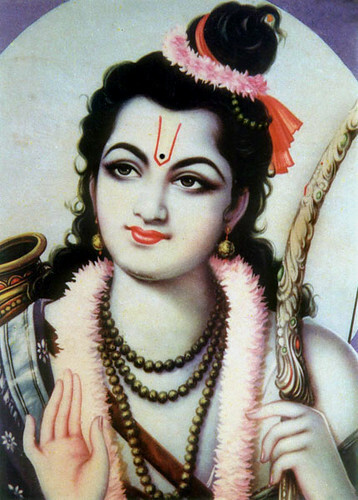 Sutiksha Muni had guided Shri Ram to his Guru Agastya Rishi. Sage Agastya presented Ram with many divine weapons and powers here. He also advised Ram to make his Ashram on the banks of the Godavari River and live there. On the banks of the Godavari River there is place popularly known as Tapovan, which is the actual Panchvati of the Ramayan era. It was here that Shri Ram, Lakshman and Sita resided here in a small hut. The incident of the cutting off the nose of Demoness Shupnaka took place here. It is from here that “Nasik” derived its name as the Sanskrit name for nose is “Nasika”. Khar, Dhooshan, Trishara and 14,000 other Demons were slain by Shri Ram in this area after they attacked Shri Ram on hearing about this incident from their sister. The kidnapping of Sita by Ravan, The slaying of Mareech and the Slaying of Jatayu by Ravan all took place in a forest known as Jansthan in this area. In the ancient times, the ashram of Gautam Rishi was in the holy town of Trimbakeshwar (one of the twelve Jyotirlings) nearby. In order to release himself of the burden of a curse on him, Gautam Rishi had created the Godavari River. There is ancient temple of Devi (Goddess) Tuljabhavani here. It is believed that Shri Ram and Sita roamed in the forests near the temple. It is also here that Lord Shiva and his wife Sati came for the “darshan” (sighting) of Shri Ram and Sita. 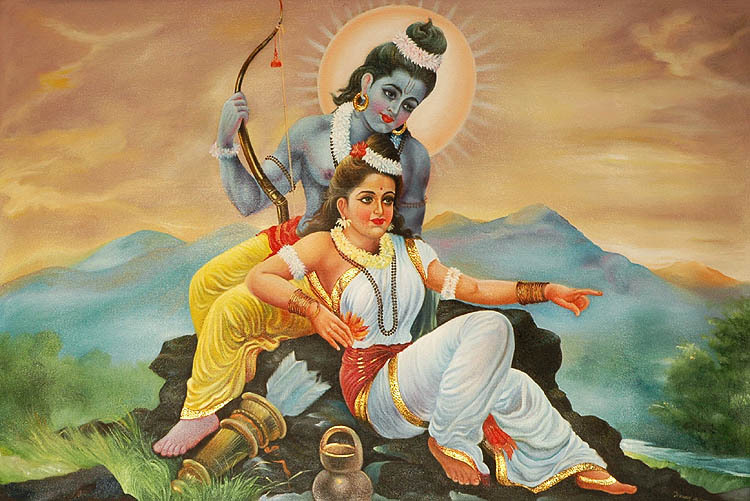 Sati took the form of Sita and tried to get close to Ram in order to test his purity. In the Indian state of Karnataka there is a village called Kardigud where it is believed that Kaband Ashram was situated. Shri Ram and Lakshman slayed the demon Kaband here. After he was killed, Kaband became a “Gandharva” (equivalent of angel) and left for his heavenly abode. Before leaving he had requested Shri Ram to visit the Ashram of Shabri. Around 14 kilometers in the Northern direction from Ram Durg, near the town of Gunga is placed called Sureban. This is place where Shabri, who was a disciple of Sage Matang lived. She had waited long years for her dear Ram to arrive, and on his arrival she fed him berries which she had tasted herself to make sure that they were sweet. This angered Lakshman but Shri Ram pacified him because he could see her intense love and devotion towards him. It was Shabri who then instructed Ram to approach Sugreev in the search for his beloved wife. This was the place where Hanuman met Shri Ram and Lakshman for the first time. In fact Sugreev had sent Hanuman to meet with them in order to make sure that they were not the spies of his brother and archenemy Bali. The might Hanuman lifted Shri Ram and Lakshman on his shoulders and took them on Rishimukh Parvat to meet with Sugreev. The capital city of Sugreev “Kishkinda” is also near by. Near the ancient Kishkinda, around four kilometers from the town of Hampi, there exists a Mountain called Malbhavant (Prastravan) where Shri Ram has spent the monsoon season. The places to see around this area include Bali Bandara, Anjani Parvat (mountain), Matang Rishi Mountain, Spatik Sheela. It was on the Spatik Sheela that the Varan (monkey) Sena (army) had collected for the first time. Hanuman had given the news of Sita to Shri Ram at this place. The old name for this town is Trishirapalli. This was the abode for Ravan’s brother Trishira and so named after him. On the banks of the Kaveri River here there is a beautiful Shiv Temple, which is said to destroy sins. According to popular legend, Shri Ram had prayed to Lord Shiva here in order to free himself of the sin of slaying Khar and Dooshan. On his way to Lanka, Shri Ram had stayed here. Along with the entire Vanar (money) Sena (army), Shri Ram had proceeded towards the Southern direction from this town. It was also from this place that Shri Ram had the first view of the sea. The footprints of Shri Ram are still found in the forests of this area. Ramnathpuram is on the shores of the waters bodies on the Southern tip of India. It is on the way to holy pilgrim town of Rameshwaram. It is believed that the foundation stone of the Ram-Setu Bridge constructed by Ram and the entire army to cross over to Sri Lanka is placed here in a small village called “Chedu Karai”. One can still see the foundation stones of this architectural wonder ten feet below the waters of the ocean. Vibhishan, after having been insulted by Ravan had come to seek the help of Ram at this place. The entire strategy for the war was also devised in this town. Places worth to visit in the neighborhood include Vilundi Tirth, Ekanth Ram, Agni Tirth, Ram Jaroka, Kodand Ram Mandir, Jata Tirth and Darbashainam. It is believed that it was in Darbashainam, that Shri Ram made a Darbasan (a seat of grass) and prayed to Varun Devta (God of the Sea) for three continuous days for giving him passage to Lanka. Varun Devta (God of the Sea) appeared after three days and advised Ram to build a bridge across the sea to Lanka. Rameshwaram is one of the twelve Jyotirlings in India. Shri Ram had established a Shiv Ling in the temple here using the sand from the sea. Approximately one or two kilometers from this temple, Nal vanar (monkey) along with the other vanars (monkeys) had made the bridge to Lanka. This bridge was constructed in five days only. Shri Ram crossed over to Lanka with his entire army using this bridge and camped at Suvel Parvat (Mountain). NASA has used modern satellite technology to photograph this bridge and they have actually unearthed an ancient bridge connected India to modern day Sri Lanka.